You would think that because my brother, Eddie, and I fall from the same tree that we would have very similar tastes and interests in food. Well, this is one case where my taste bud apple rolled far from the family tree. protein dishes, at least one vegetable dish, and the soup. Some nights, it could be sautéed pork’s kidneys or little baby octopus dipped in a tangy ginger dressing. Warren and I would get into raging fights that lead to either one of us wearing a big bruise (and it was usually me). Eddie and my younger brother, Jimmy, would usually enjoy this thoroughly, to the point where Eddie would be mocking Warren and me while Jimmy would literally be spewing milk out of his nose. 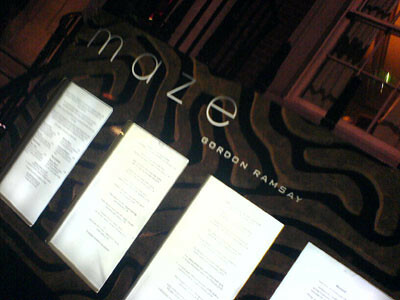 So, living out of nostalgia, I thought it would be nice to add a little bit to Eddie’s column from across the pond and write about my Deep End Dining experience at Gordon Ramsay’s Maze in London. Having lived here for four years now, I can attest that the food served in restaurants has evolved ten-fold. I moved here from New York City and was spoilt with a flood of great restaurants there. Then I discovered Gordon Ramsay! He has acquired quite a bit of notoriety over the past few years with his foul mouth approach in the kitchen to the number of Michelin restaurants he has under his name. I’m sure you are all familiar with his show Hell’s Kitchen. To say that Maze has become one of my all-time favorite restaurants would not then be a surprise, however to say that I had a dish that seemed too exotic and not prepared to my liking would be! I have been to Maze probably over a dozen times since it opened last year and never once had a dish I disliked until… UNTIL I decided to try something different. Sure I grew up in the same household as Eddie but I never tried the crazy foods my mom served. My younger brother and I would opt for the more “American” option of beef and broccoli and the like. 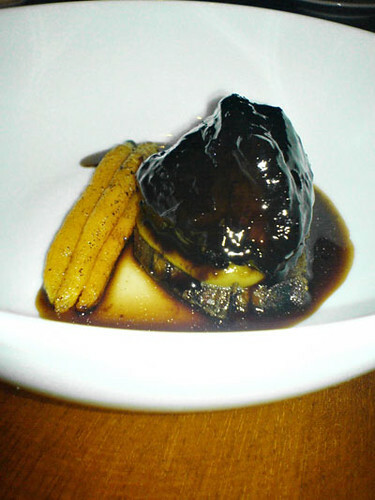 So I thought I would be crazy and try the Beef ‘tongue ‘n’ cheek’ with caper raisin and ginger carrots. The concept at Maze is to serve dishes in a tapas style where you order anywhere between 3 – 5 small dishes which allows you to sample a fair selection of the menu. I started out with the Halibut and Tuna Carpaccio, moved onto the Artichoke salad with Truffle dressing, then along came the Broadbean risotto and after a VERY long wait, the Beef tongue and cheek. And when I say a VERY long wait, I mean it. The past few times that we’ve dined at Maze, we’ve noticed a definite lag time between serving the "light" courses and the "heavy" courses. This last dining experience had us waiting about 30 minutes – we were ready to take the check and leave had we not had wine left to finish. neighbors, I decided to bite the cow’s tongue. I tried to keep an open mind and not let the idea of a huge, slobbering cow’s tongue distract me from the taste and structure of my dish. And to my amazement, I did NOT like it. I kept thinking, everything that has come out of this kitchen has always made my tummy quite happy thus far, so I’m sure tongue can be made to be just as tasty. Wrong. The image of the cow’s tongue just would not go away. It was almost like the creepy scene in Willy Wonka and the Chocolate Factory when the group goes on the boat ride on the chocolate river and through the psychedelic tunnel where they see the image of the slaughtered chicken, but, for me, instead of the chicken I saw cow. Images aside, the texture and appearance weren’t all that desirable either. A big serving of the cheek lay on top of a thin slice of tongue. Separating the two, I found a gooey film within the cheek that just fueled my image of a slobbering bovine further. I took a bite of the tongue and found it bland and slightly rubbery. I took another bite just to give it a fair chance and didn’t find any difference. My neighboring diners, being English, told me to send it back and say that the dish wasn’t speaking to me. Talk about tongue-and-cheek. Great post! Thank you for giving us a taste of London. It's the home of my ancestors, and I have yet to visit. Unfortunately, it seems the Brits can't cook "odd" meat very well. Sorry you had such a bad experience. I haven't tried cow tongue and cheek, and now I'm not so sure...Maybe if there is a Chinese variation. You're a big wuss! I can't believe you are related to me! I got a reputation to keep up, homesis. Thanks for the insight into the Lin family dinner. Even if you don't take after your brother in enjoying bizarre foods, your narrative flows like his. This was an enjoyable post. I can relate with the beef tongue story; the only time I was able to enjoy beef tongue was when I didn't know it was beef tongue. thank you juliet and elmomonster. i'm glad you enjoyed the post. as eddie had mentioned, i have two children and haven't been able to use much of my brain except in cooing and babbling ways, so it was nice to write something for the adult crowd. next up... perhaps i will try st. john's or the fat duck. thanks again! Lovely post, babylin. I live in England and my father-in-law always treat us with homemade ox tongue sandwiches when we go visit them at Christmas time. Thin slices, a bit of English mustard, fresh baked wholemeal bread and a cuppa! I like it, but I agree it's nothing fantastic. In a way is interesting to taste something that can taste you back. I think that's what Eddie would say. It was very brave of you to try something that adventurous. I love tongue myself, but the men in my family have always enjoyed Chinese organ meat dishes. I remember my first exposure to them was at the age of five, when I crunched into a plate of Cantonese chicken fallopian tubes, which I thought were incredibly tasty. To steal a phrase from Upton Sinclair, my little brother and I have probably eaten almost every part of a pig but the squeal. However, my little sister and my mother have always refused to touch the organ meats. You are absolutely right about tongue being nothing special. Other than the texture, which is an acquired taste, there's very little to recommend about it. What great encouragement and support on the odd food front! Actually, I have tried a few 'exotic' dishes in the past while living at the nest. I just don't get the same type of dares and bets anymore to coax me into the deep end. Thanks for reading! You know, as a kid I had no trouble eating tongue. When I got older and found out what it was, and saw the little taste buds and veins or whatever those tubes are that run through it...fugeddaboutid!